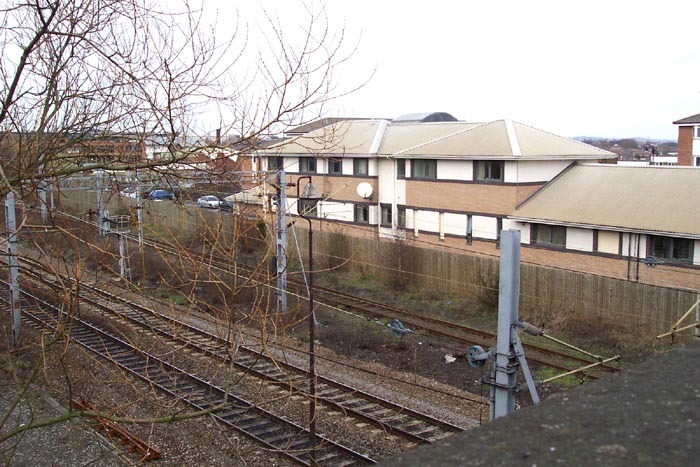 Monument Lane station was opened by the LNWR on their New Street - Wolverhampton High Level 'Stour Valley' line in 1854 and, along with the passenger station, facilities were also provided for a sizeable goods yard and loco shed. The station is especially interesting as it was maintained after closure to passengers as a ticketing stop as New Street was classed as an 'open station' (access to it being a public right-of-way) and so no ticket control was provided there. Thus, stations immediately ringing New Street were used for boarding trains and inspecting and/or selling passengers tickets (Five Ways was also retained in this manner). 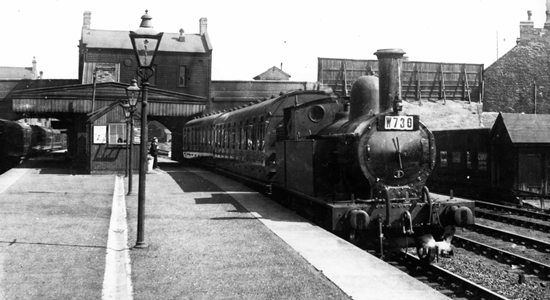 Furthermore, The Harborne Railway joined the LNWR line at Harborne Junction just along the line from this station and its trains used to stop here on their way to New Street thus it was an 'honorary' fifth station on the Harborne Railway before its destination at New Street. The photograph above shows Monument Lane station in 1950 looking towards New Street (photo: Millbrook House). The station closed in 1958. 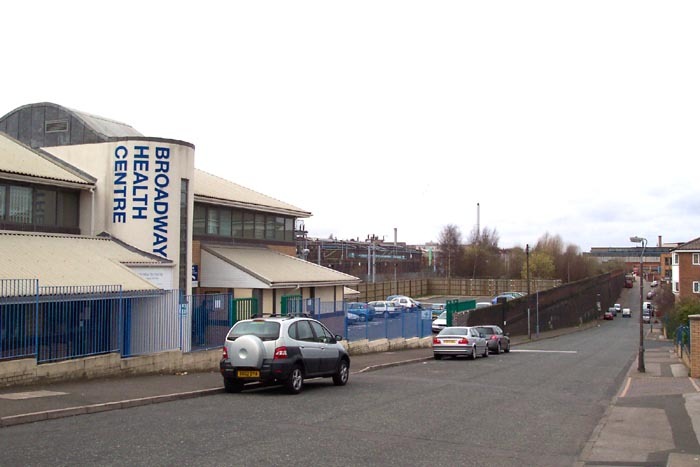 Above-left we are on the corner of Ladywood Middleway (previously Monument Lane - and Street) and Cope Street with the station site to our left now occupied by a Health Centre. Above-right we are on the Ladywood Middleway bridge over the tracks looking at the site of the station in the direction of Wolverhampton. A large island platform occupied the land immediately to the left of the tracks in this shot but unfortunately, I haven't seen a wide enough shot of the station to determine the exact arrangement of the platforms. Above-left we are in the same position but this time looking directly towards Wolverhampton. The aforementioned island platform lay dead in front of the photographer and had wooden waiting rooms and canopies and a wooden kiosk at one end that was used by ticket collectors. 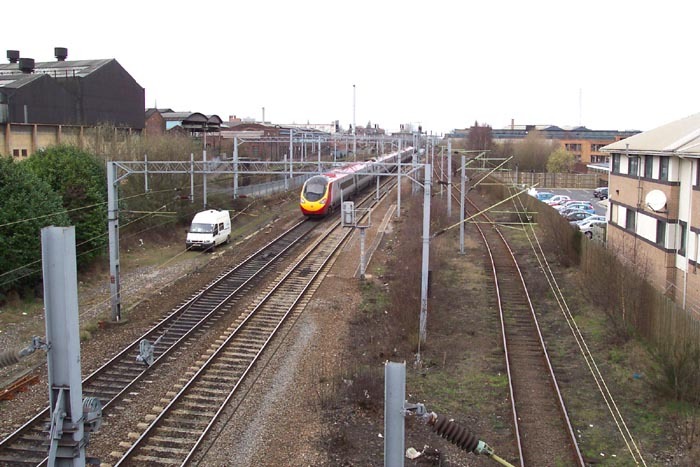 A Pendolino has just passed the site of the old station and to the left we can see a track repair van. 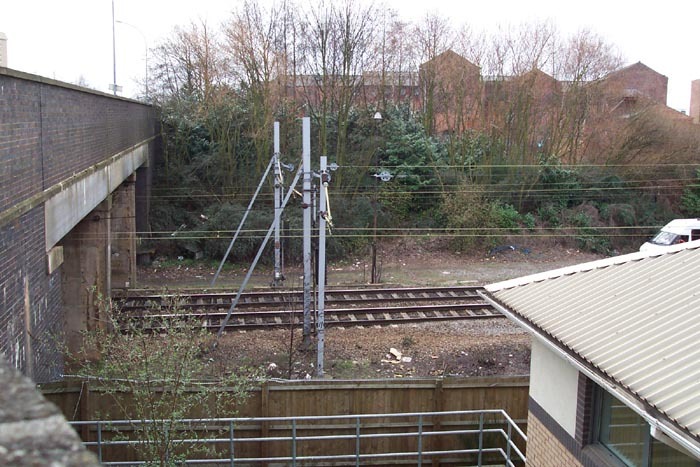 Above-right we are on the corner of Ladywood Middleway and Cope Street looking down at the station site - the Ladywood Middleway bridge to the left is not the original but rather one built along with the creation of the ring road in the late 1960s. 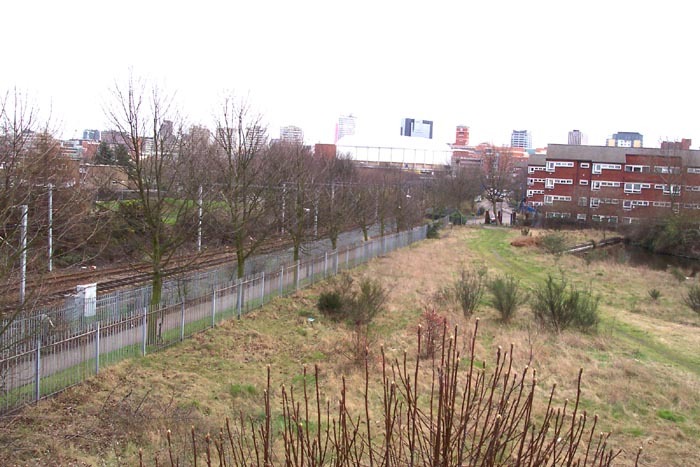 Above-left we are taking in the view from the other side of Ladywood Middleway from the station at the site once home to Monument Lane shed and goods yard; now a housing estate. The skyline too has changed out of all recognition with the National Indoor Arena now dominating (the odd-shaped white building in the distance). 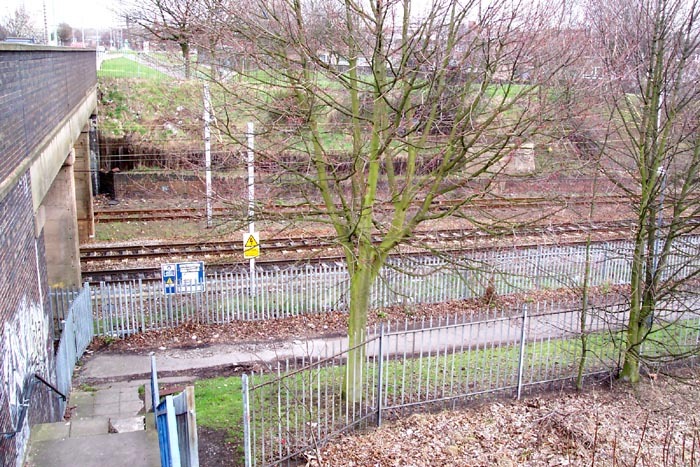 Above-right we are descending the steps from Ladywood Middleway and looking down to the spot once occupied by a high-rise signalbox designed thus to enable the signalman to see trains approacing the station and yard over the top of Monument Lane itself: the top of the box can just be seen in the photograph at the top of the page top-right. Unfortunately, there is little left today worth seeing at the site but it must have really been worth a visit in its heyday with the station, goods yard and loco shed.